A non-intrusive Smart Metering sensor network at Railway System level. An open system and interface for data collection, aggregation and analysis in an open source Operational Data Management (ODM) Platform. A set of User Applications design and specifications to exploit the energy analysis process, as well as other possible improvements such as preventive maintenance. WS 1 – Management of Energy-related Data. 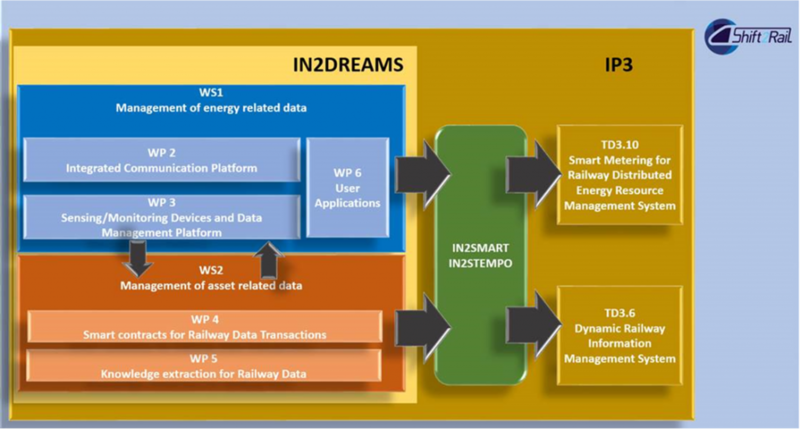 It aims to remove the current limitations of Railway Energy Management Systems (REMS), by making these capable of supporting a much wider array of requirements by offering a solution able to flexibly adapt to different energy and asset management application requirements. This work is directly related to the Technical Demonstrator TD3.10: Smart Metering for Railway Distributed Energy Resource Management System. WS 2 – Management of Asset-related Data. It aims to define the necessary IT solutions and related methodologies for business security, economic sustainability and decision support in the field of data processing and analytics in railway applications for asset management. This work is directly related to the Technical Demonstrator TD3.6: Dynamic Railway Information Management System (DRIMS).